There is nothing better than spending a day out with your friends and family. On top of that, if you get to spend a day near the water, then kayaking is a must. Kayaking will help to improve your happiness and fitness in the long run. You might currently own a kayak or are looking to purchase your very first. Tandem kayaks are the best kayaks for everyone. You get more storage, more room, and have an extra seat for a kayaking partner. Being alone on the water with nothing but nature is great. But sometimes, you want that extra company to keep the journey alive. So, to help you decide the perfect tandem kayak, we’ve compiled a list of the eight best on the market. They range from different price points and materials – so, there’s sure to be one (or more) that perfectly suits your needs. To help you even further, we’ve included a buying guide and FAQ section to answer any and all of your questions. Though Brooklyn Kayak Company is not a fairly well-known company in the kayaking world, the TK181 12-foot Sit On Top Tandem Kayak model shows that they will be soon. It contains some great features as well as a great design. The first thing that most people will note about this kayak is the color options available. It’s available in six different color schemes, including Blue, Desert Sand, Green Camo, Grey Camo, Red Yellow, and Yellow Orange. The green and grey camo models are great for fishing expeditions, as bright colors can scare the fish. For visibility purposes, you should go for the brighter colors. The model comes with great tracking and maneuvering capabilities. 2 person kayaks are harder to maneuver around as they are longer, but the TK181 12-foot Sit On Top Tandem Kayak model is able to maneuver with ease. Though kayakers often focus on the calmer waters, it best to own a one that can handle rougher waters. This tandem kayak has a carefully balanced full, which helps to provide it with maximum stability even when the waters are rough. The Brooklyn Kayak Company (BKC) TK219 12 ft. Two person Sit On Top Kayak incorporates modern technological features into their kayak. The price point sits this model in between quite a few of the other models on this list. However, unlike others on this list, this tandem kayak can hold up to three riders, instead of just the typical two. It’s more lightweight than other options, but not by much. Though the 70 lbs. might be hard for one person, it should be a problem for two or three riders holding it together. The TK219 12 ft. Tandem Sit On Top Kayak has enough space to hold all of your fishing gear. It also features four flush mounted rod holders and two adjustable holders. The large vestibule allows plenty of deck lashing. This model by BKC has everything that you could need in a tandem kayak. Along with the features, it also has a stylish design. The color choices include Camo design, Grey Camo design, Red and Yellow Sunset, and Sky Blue design. One of the most recognized aspects of this Intex Explorer K2 Kayak is the wide beam that offers riders with the highest amount of stability and tracking ability. The high back seat comes with lumbar support, which increases your comfort while you’re paddling. Though this is cheaper than most two person, it still manages to retain the overall quality. The Vibe Kayaks Yellowfin 130T 13 ft. Tandem Sit On Top Kayak is loaded with all the features. It has to be one of the most feature-rich kayaks on this list. Just as it is feature rich, it is also high in price – but the price to value ratio makes it worth every penny that you spend. You might see quite a few kayaks that feature molded footrests set at predetermined intervals, but the Yellowfin 130T takes it a step further. The footrests on this model are fully adjustable, which means that you can dial them to be perfect for your needs. The seam alignment between the upper and lower section of the mold is a little bit off. The aluminum frame of the Advanced Elements Advanced Frame Convertible Inflatable Kayak provides it with the rigidness that it most inflatable boats do not possess. That does come with a price though. Though it’s more likely to perform as a traditional kayak instead of an inflatable one, it will cost you more than a normal inflatable one. The three-layered materials for the construction of the inflatable kayak make it puncture resistant. This minimized and lightweight Driftsun Rover 220 Inflatable Tandem Kayak enables you to enjoy kayaking regardless of where you go. 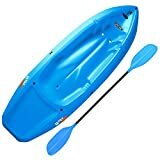 The kayak remains sturdy through the rough vinyl finish along with the inflatable I shaft bottom that allows it to give a laid-back ride. It also features a removable skeg. It’s lightweight and durable. It can even be fully inflated in less than ten minutes. The rigid high-pressure drop stitched floor provides unmatched control and stability in flat and rough water. The Driftsun Rover 220 Inflatable Tandem Kayak is built for class III and class IV rapids. 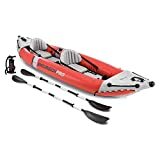 Designed with the outline of a traditional river runner, the Driftsun Rover 220 Inflatable Tandem Kayak can handle rapids with control and speed. The high-pressure drop stitch floor can rival against the feel of a traditional, hard kayak. It even includes tie-down points, self-bailing ports, and a front action camera mount. 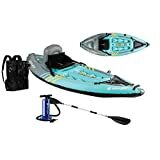 This comes with a travel bag, repair kit, rear tracking fin, double action hand pump, and adjustable aluminum kayak paddles. If you’re in the market for a tandem that is a good combination of price and quality, the Sun Dolphin Bali 13.5 ft. Tandem Kayak is a great option. It’s a great choice for those on a budget or beginner kayakers. The adjustable footrests allow you to have some flexibility, as the center of the boat can become a jump seat for the third rider. Though three people can fit onto this tandem kayak, the middle seat is best suited for children as its quite small and molded plastic. The other two adjustable seats are a nice touch to the overall design. The best feature of the Sun Dolphin Bali 13.5 ft. Tandem Kayak is the storage option available. The kayak has two large storage hatches with both placed between the paddler’s legs. In addition to that, there is another smaller sealed hatch that is placed in the middle for extra storage. At the rear of the kayak, you’ll also find another one that’s covered with shock cord lashing to store more gear. The Sun Dolphin Bali 13.5 ft. Tandem Kayak has the design of a sit on top model, which means that it’s easier to dump water out if it does happen to make its way in. It’s also easier to upright the kayak again if the boat happens to tip. The Driftsun Voyager 2-Person Inflatable Kayak is one of the best two-person’s currently on the market, with its quick setup process and compact design. With the inflation time being under five minutes, you can get on the water faster than any other kayak. The kayak is designed to be durable regardless of the weather conditions. So, even if you end up kayaking in harsh water conditions, the kayak will be able to deal well due to the pointed nose entry and rocker profile. There are certain features that are important to look out for when purchasing a tandem kayak. In this buying guide, we’ll be going through everything that you’ll need to know before you purchase your very first or next tandem kayak. Tandem kayaks have come a long way. The materials have become stronger and puncture resistant. Some even feature high-quality denier material and military grade PVC. Now, they are ultra-portable and can even fold into a small backpack. There are different types of materials that could be used to make a tandem kayak. You’ll find that the material often is directly related to the durability and weight of the rig. However, it’s important to keep kayaks of this material out of direct sunlight, as that can make it warm and brittle as time passes. If you keep that in mind, your tandem kayak will last for years to come. On the downside, you should be more careful with these materials as they are easier to damage that kayaks made with polyethylene. Though if it does get damaged, it’s quite easy to repair. However, the hard part is finding a shop to repair it. The length of a tandem kayak correlates with its abilities. A longer kayak will be harder to maneuver, but it will be better at keeping a line and handling larger waves. On the other hand, a shorter kayak will be easier to control and turn, but will not be ideal for longer journeys. The shape of the hull determines how the kayak performs while on the water. There are three main shapes that can be found on these. These are usually found on kayaks that are ideal for beginners. The flat bottom of the kayak gives riders the maximum stability in calm water conditions. This type of shape is not recommended for ocean or rough water conditions, as they won’t be able to cut through surfs. Rounded shaped hulls allow you to cut through the water, which makes them faster. These take less effort to get them faster as there is less friction on the water. However, this does lose a little stability compared to the flat-bottomed kayak, so this shaped hill is recommended for intermediate riders. If you’re looking for the fastest speeds, then the V-Shaped Hull is the choice for you. It’s great for fast speeds and long distance traveling. Though these are the least stable, they offer riders with secondary stability, which means that they can still be saved even when they are tipped on their side. These are also great for quick, sharp turns and can be maneuvered easier than other types. However, these should only be used by expert kayakers as they take a special skill set to ride. The weight can range from 30 lbs. to 100 lbs. The construction and features can either add to or decrease the weight of the kayak. So, a rigid polyethylene kayak, for example, could weigh almost double of what an inflatable might weigh. Every single kayak features a different weight capacity. While researching, you’ll often find that tandem kayak’s weight capacity ranges from 400 lbs. to 800 lbs. Some factors that might determine this limit include the amount of gear you’re carrying and the number of people riding it. The material that is used for the construction of the kayak can also play a large role in determining the weight capacity. Though you might not always be looking to speed through the water, this boating style makes paddling more efficient. So, you are able to take it a bit easier as you’re sharing the power with a peer, which allows you to go at a more leisurely pace. Tandem kayaks are known to be far superior in terms of stability with a comparison to other kayak types. This feature makes them great for teaching children how to kayak, as they will be able to gain confidence and experience while sharing the load. If you’re heading or planning on going on choppy waters, 2 prson kayaks give you that extra bit of stability that might come in handy. In comparison to a solo kayak, 2 people kayaks are great for allowing you more space to bring along your gear. On average, you’ll find that tandem kayaks allow you to bring roughly 50% more onto your boat than that of a standard solo kayak. Though this might seem like a very desirable feature, you should pay attention to the weight of cargo that you’re bringing onto your boat. Kayaks that are weighed down by cargo will perform significantly less than lighter boats. As the previous section states, you’ll find that 2 person kayaks offer you with more space and more storage options. These boats generally have a much more efficient design that is great for storing your gear along with holding more people. This makes the more practical, while also being faster and more efficient. On average, these kayaks can hold about 1.5x the storage of a solo kayak, which is why they come in larger sizes. As with any other purchase, it’s important to consider your budget before making a big purchase. You’ll find that most kayaks are investment pieces. For this reason, you should be aware that these kayaks often come with heavier price tags than their solo counterparts. This is simply due to the fact that they have double the capacity. Q. Is Paddling On A Tandem Kayak Different To That Of A Solo Kayak? Q. How Long Are Tandem Kayaks? Q. What Are The Weight Capacities Of A Tandem Kayak? A. Due to the fact that they are designed for two riders, they will have a much more generous weight capacity than solo kayaks. Tandem kayak’s weight restrictions can range from 400 lbs. to 650 lbs. By asking yourself how much gear you’ll be bringing, the weight of you and your partner combined, and your intended use, you’ll be able to figure out which is the best kayak for you. Q. How To Store A Tandem Kayak? For those that do not have enough space, you can store your tandem kayak outdoors. However, just ensure that it is not in direct sunlight. This will increase and maintain the durability of your kayak. Regardless of what type of kayak it is, you should ensure that you rinse it before storing it away. Spending time on the lake is always a fun plan. Adding kayaking into the mix just makes it even better. To top it all off, being able to kayak with a partner to share the weight and have some laughs along the way just make the trip even better. Our list of the best products currently on the market, along with our buying guide and FAQ section is specially designed to get you the best information possible. All that’s left to do is for you to get out on the water with your brand new tandem kayak.